The Black Wood Turtle can be quite shy when first approached, but it will quickly peek back out looking for a snack! The Black Wood Turtle is the largest member of the Wood Turtles in the Rhinoclemmys genus, reaching up to 14" (35 cm). Wild-caught specimens have been imported from northern Central America in the last few years and are commonly available in the pet industry. As their name suggests, these are a big dark turtle, though they may be more on the brown side of black especially when young. These and all the Central American Wood Turtles are likely candidates for captive breeding programs. The Central American Wood Turtles are an appealing group of turtles. They are great to keep and will soon become tame. They are a manageable size for most keepers and have proven to be extremely hardy once established. The Black Wood Turtle, like the other wood turtles is somewhat shy and will often race under a shelter at the approach of its keeper, then will cautiously reappear to see if any food has been offered. Unlike the others that wander on land, this turtle is predominantly aquatic but it will enjoy a basking area protruding from the water. Distribution: The Black Wood Turtle Rhinoclemmys funerea, a Central American Wood Turtle, was described by Cope in 1875. Ranging from the Coco River in northern Nicaragua, south through Costa Rica to central Panama, they are commonly found in or around marshes, swamps, ponds, and slow moving rivers in forested areas. In all there are eight species of Wood Turtles (and several subspecies) in the Rhinoclemmys genus. They are found from Mexico and throughout Central America. 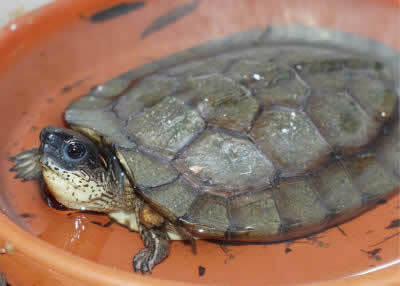 The Mexican Spotted Wood Turtles Rhinoclemmys rubida were classified in the Rhinoclemmys genus, but some sources now place them in the genus Chelopus. Status This turtle is listed on the IUCN Red List of Threatened Species: LR - lower risk. Description: The Black Wood Turtle, as its name implies, is a large dark turtle. Though it is basically black it can sometimes be on the more brownish side of black, especially when young. Its limbs are speckled with a lighter color and it jaw, sometimes up onto the sides of the face, is a yellowish color spotted with black. They are the largest of the wood turtles, though only marginally larger than Spot-legged Wood Turtles R. punctularia, with an adult reaching up to 14" (35 cm)in length. Smaller wood turtles such as the Ornate Wood Turtle Rhinoclemmys pulcherrima manni only grows to 8" (20 cm) in length. Care and Feeding: Wood turtles have a wide range of feeding habits, but most species are omnivorous. Wood turtles will eat earthworms, redworms, crickets, and even mice. Once or twice a week these turtles also eagerly consume a salad consisting of chopped and shredded fruits and vegetables. They are especially fond of kale, zucchini, squash, mango, cantaloupe, banana, and apple. Dust this salad liberally on every third or fourth feeding with a high-quality calcium and multivitamin powder mixture. However the Black Wood Turtle R. funerea has an even more carnivorous diet, including the TTPG Aquatic Turtle Mix® and live invertebrates. Even occasional feedings of MAZURI Tortoise Diet® or high-quality canned cat food (beef, chicken, or fish) mixed with fruit and dusted with calcium and multivitamin powder can be offered when fed on land. Add apple, banana, and mango, chopped and grated, into the MAZURI Tortoise Diet® or as a special treat during the spring and summer. Care must be taken that these, and any turtles, are not released into a wild habitat. The reasons are many. The introduction of non-native species can lead to the introduction of diseases and can lead to hybridization of introduced and native species. In addition, many turtles raised in captivity and released into wild situations are confused, unable to cope with extreme weather changes, and many surely fall prey quite quickly to the wary predators they may encounter. An enclosure for wood turtles closely mirrors a slightly drier version of an enclosure for marshy pond turtles, such as those of the Clemmys genera. A small breeding group of wood turtles, two males and four females, can be properly maintained in an 8' x 8' area outside or in a medium to large tub or stock tank inside. Substrate in indoor enclosures consists of a three layer system: a layer of pea gravel followed by a 10-12" layer of �½ dampened sand and �½ peat moss, followed by a thin layer of cypress mulch. For the more aquatic species of wood turtles, such as the Black Wood Turtle, an indoor basic setup for aquatic species is used. A large tub or stock tank will be sufficient to hold a trio of adults. Add an efficient flow-through filtration system, a shop light fixture with UVB-emitting bulbs, and a basking spot with a spotlight mounted above. Add a variety of floating and submerged aquatic plants as this omnivorous turtle will find them very appealing. Handling: Captive-hatched specimens, as always, are the best to keep as pets and most will become so docile that they can easily be fed by hand. These and all aquatic turtles should be considered wonderful display animals and not pets that are easily held. Breeding: Some wood turtle species including the Black Wood Turtle, along with the Ornate Wood Turtle R. p. manni, have proven easy to breed. Literature suggests that most of the other Rhinoclemmys should also be fairly easy to breed in captivity. Most wood turtles will require a period of hibernation in the mild 60° to 65° F (16° to 18°C) range to inspire courtship and mating. Successful breeders cool their adults in a monitored indoor situation for between 45 to 60 days during the cooler months. Rain, both natural and man-made, is an important trigger for courtship and breeding in these humidity-loving species. The wood turtle babies are hardy and grow quickly when offered a healthy diet featuring a variety of feeder insects such as redworms, mealworms, crickets, and waxworms, along with fruit and soaked commercial pellets offered soaked in a flat dish or tossed into the aquatic portion of the enclosure. Ailments / Health Problems: Since most Black Wood Turtles, as well as the other Rhinoclemmys species have only been available as imported specimens, you can expect them to be harboring any number of parasites, especially roundworms. They have proven easy to "clean up" with Panacur® and Flagyl®. The resulting parasite-free turtles quickly put on weight and once acclimated well, tend to become quite sociable, even taking their favorite food (bananas) out of their keeper's fingers. Rhinoclemmys often arrive to importers with some scrapes and cuts, the most severe problems being shell rot and missing scutes. These maladies and injuries seem not to affect them too much and they clean up well with a Betadine® scrub and 3-4 applications of Silvadene® cream when kept in a warm, well-planted enclosure. Availability: Black Wood Turtles are commonly imported and there are also captive bred specimens occasionally available. Captive bred make the best pets and are less prone to harboring parasites. These turtles can be purchased from better pet stores, from breeders at the larger reptile shows across the country, and on-line.